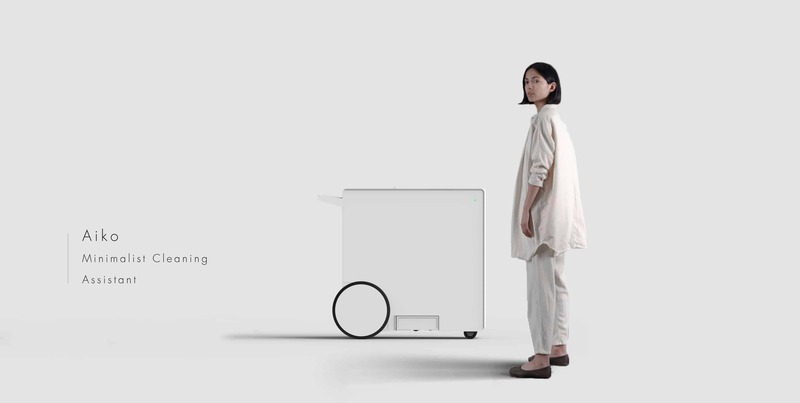 Aiko is an intelligent cleaning assistant for help cleaning peoples in their work. The principal aim of this research is the development of an idea that could be of service to people. The artificial intelligence of the project aims to prepare the work space of a cleaning employee. I read a study on the internet that spoke about the deplorable conditions of certain trades, and after that I was interested in the cleaning sector because it was the one that was the most critical and that I could intervene. At the base the project was called “the trades of the shadow”. The utopia of the immaculate white and the relation of this color to the cleanliness inspired me concerning the color. All this accumulated to the Japanese inspiration of the form. Fist, I analyse the subject, it’s the most important part. Then I do sketches on an Apple iPad Pro 2, and after I try to work on a human scale for make plans. I use Adobe Photoshop, Illustrator, In design for the development and for the end I do 3d model with SolidWorks. For concretize the project I make 3D rendering with Keyshiot 6 software. The project has just been born, time will tell if people are interested.This project is the most complicated for me because there is lot of parts and equipment inside the assistant. But I learn to make compact product with lot of element inside. I’m a young French product designer, I’m 20 years and I’m a big design passionate. I want make object different from the norm, with a real identity. I have a design product professional degree and from an early age I have known that I want is to create objects for make peoples live’s simply.